Tolazamide is used with a proper diet and exercise program to control high blood sugar in people with type 2 diabetes. It may also be used with other diabetes medications. Controlling high blood sugar helps prevent kidney damage, blindness, nerve problems, loss of limbs, and sexual function problems. Proper control of diabetes may also lessen your risk of a heart attack or stroke. Tolazamide belongs to the class of drugs known as sulfonylureas. It lowers blood sugar by causing the release of your body's natural insulin. Take this medication by mouth with breakfast or the first main meal of the day as directed by your doctor, usually once daily. Some patients, especially those taking higher doses, may be directed to take this drug twice a day with the morning and evening meals. The dosage is based on your medical condition and response to treatment. If you are already taking another diabetes drug (such as chlorpropamide), follow your doctor's directions carefully for stopping the old drug and starting tolazamide. What conditions does Tolazamide treat? Stomach cramps, bloating, heartburn, loss of appetite, constipation, diarrhea, nausea, vomiting, and weight gain may occur. If any of these effects persist or worsen, tell your doctor or pharmacist promptly. Tell your doctor right away if you have any serious side effects, including: skin changes (such as darkening, thickening), unusual fatigue, fast/pounding heartbeat, easy bruising/bleeding, mental/mood changes, sudden weight gain, swelling hands/feet, muscle weakness/spasm, yellowing eyes/skin, persistent nausea/vomiting, severe stomach/abdominal pain, dark urine, signs of infection (such as fever, persistent sore throat), seizures. List Tolazamide side effects by likelihood and severity. Before taking tolazamide, tell your doctor or pharmacist if you are allergic to it; or if you have any other allergies. This product may contain inactive ingredients, which can cause allergic reactions or other problems. Talk to your pharmacist for more details. Before using this medication, tell your doctor or pharmacist your medical history, especially of: kidney disease, liver disease, thyroid problems, certain hormonal conditions (adrenal/pituitary insufficiency, syndrome of inappropriate secretion of antidiuretic hormone-SIADH), electrolyte imbalance (low sodium blood level). Limit alcohol while taking this medication because it can increase your risk of developing low blood sugar. Rarely, alcohol can interact with tolazamide and cause a serious reaction (disulfiram-like reaction) with symptoms such as facial flushing, nausea, vomiting, dizziness, or stomach pain. Consult your doctor or pharmacist about the safe use of alcohol. What should I know regarding pregnancy, nursing and administering Tolazamide to children or the elderly? Does Tolazamide interact with other medications? Should I avoid certain foods while taking Tolazamide? If someone has overdosed and has serious symptoms such as passing out or trouble breathing, call 911. Otherwise, call a poison control center right away. US residents can call their local poison control center at 1-800-222-1222. Canada residents can call a provincial poison control center. Symptoms of overdose may include: shakiness, fast heartbeat, sweating, loss of consciousness, seizures. Attend a diabetes education program to learn more about diabetes and the important aspects of its treatment, including medications, diet, exercise, and getting regular eye/foot/medical exams. 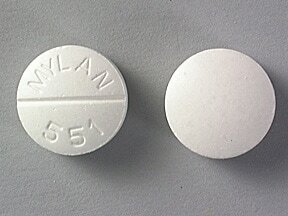 This medicine is a white, round, scored, tablet imprinted with "MYLAN 551". 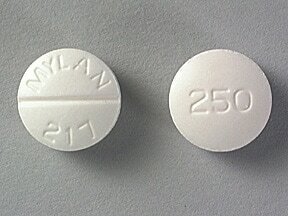 This medicine is a white, round, scored, tablet imprinted with "MYLAN 217" and "250". Are you considering switching to Tolazamide? How long have you been taking Tolazamide?